This is a step-by-step analytical course leading to the evaluation of stocks of local companies. The objective of the course is to provide you a step-by-step approach leading you to learn how to analyse stocks. This course starts you off with the essential guiding principles for stock investing. It serves as a backdrop that every investor should aim for when comes to investing in stocks. Students will be guided how to read financial reports and to analyse the data in a step-by-step manner. The course will be initially launched with about 25 videos in 4 separate sections and spanning more than 5 hours of learning experience. It is planned that there will be additions after the initial launch, whenever appropriate. Specifically, separate videos have been made to highlight the learning points and common doubts that students generally have on the subject matter. All examples are picked up from local stocks listed on the Singapore Stock Exchange (SGX) so that students can better associate with these companies. Students will be guided on the expectations of different types of companies and to carry out the analyses leading to the applications of various valuation techniques. While not mandatory, it is encouraged that students study the course sequentially to have a good understanding of the subject matter. Additional videos will be included, whenever appropriate, after the initial launch to keep the course content extensive and up-to-date. 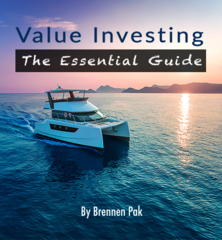 This course is for those who are serious about learning how to do value stock investing. It provides the necessary in-depth financial knowledge to help bring one to a proficient level to be able carry the proper stock evaluation. This course guides you through the basics but the necessary skills in stock investing. It is like helping you to learn ABCs before you are able to write serious essays. But don’t underestimate basics. It is always the basics that help to build our foundation and reinforce our understanding about stock investing. Many sophisticated investors today started off from basics before they can become a pro. It is a necessary stage that one has to go through. But again, don’t take basics as mere basics. You may be surprised that you may not have known or come across a lot of concepts in your unstructured learning process of stock investing. Surely a course of at least 25 videos lasting for more than 5 hours of learning experience cannot be just simply basics that you can pick up on ad-hoc basis. Even then, it still takes a lot of time to reap and harvest the knowledge to enhance your learning experience. Furthermore, the examples in the videos were taken from the local context to help students associate better with their learning experience. It is recommended that that this course be taken in conjunction with my other course “The Ultimate Guide”. “The Ultimate Guide” covers an extensive scope of stock-investing techniques that cuts across many key areas to help students augment their stock investing results and to avoid making costly mistakes. Check out The Ultimate Guide. Together with this course covering detailed stock evaluation, the combination is an impactful complete continual approach that every stock investor needs for stock investment. 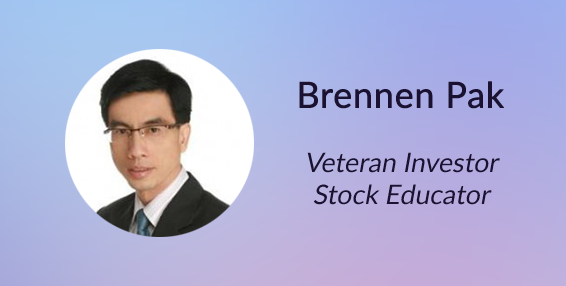 Brennen Pak is a veteran stock educator and investor who retired at the age of 46 after attaining financial freedom. Stock investing involves financial knowledge, technical and analytical skills, business mindset, psychological thinking as well as guts and experience. It is not a skill that can be attained in a week, a month or even a year, but through years and years of incessant drilling and learning. The irony is that all this only happens in the new millennium after his huge fall during the Asian financial crisis in 1997/1998. By then, it had already been almost 10 years after he started stock investing. Magically, in only the next 10 years into the new millennium, he attained financial freedom. In total he spent only 22 years in corporate life. You may think that his wife helped in the family expenses? No, his wife left her corporate life even earlier, two years before him after the birth of their child. You may think that he had sold a property, or inherited a business or inherited a fortune from a relative? No, he does not have any of those. In fact, he had been pretty on his own. He father stopped paying for his schooling after his secondary school. He had to give tuition to pay for the university fees all on his own. Perhaps, you may think that he had a high earning from his corporate life? No, he is just an ordinary guy with a relatively standard remuneration just like any of his peers. In fact, if you meet him on the street, you probably may not recognize him to have attained financial freedom living on his own terms. All these things came about was probably because he did one thing correctly - he started investing just as he started to earn his first dollar. But that still came with a huge cost. He spent almost 10 years exploring and groping in the dark to find the right footing, and still, paid dearly during the Asian financial crisis. Good news is, he is now able to share this knowledge with you through the online courses. They help equip you with the necessary superb skills and knowledge to fire your way to become a true value investor. 1. Not from finance background or never invested before? All the more you should equip yourself with the necessary investing skills and financial knowledge. In numerous studies on investing psychology, many newly-minted investors think that they can invest better compared the other investors out there. It is like many drivers who think they are better drivers than the others on the road. The reality is that they get into road accidents just as many times as what was found in statistics. Worse of all, their over-confidence could make them pay a high price. 2. Want to get started at your own pace? Event-based course fees to learn value investing can cost a huge sum. Apart from the financial aspect, time is a big constraints for many of us especially for those whose families members depend on us. Thankfully, technology is right at our footstep. It is here for us to harness upon as far as learning and acquiring knowledge is concerned. That is exactly why we put this course online. For a fraction of an off-line course fee, you can start and learn according to your own pace, at any time and at any place so long as you have an internet access. 3. Is there any pre-requisite for this course? There's no pre-requisite for this course. All you need is a passion for value investing and be willing to learn. Although having some financial knowledge, good business sense and comfortable with numerical numbers certainly helps, it does not mean people can’t learn value investing skills. Learning how to invest for this course does not require sophisticated mathematics or rocket science. Most of the calculations, if any, can be carried out using a non-scientific calculator. So, basically if you can use a simple calculator, you are eligible for the course. In fact, with an online course, you can replay the concepts again and again until you are drilled with the subject well before you jump into the next topic. Unlike an offline course for which you are likely to pay for more than a four-figure sum each, once you missed the concept, you probably be lost for the rest of the course. 4. Can I expect any follow-up from the instructor? Yes definitely. Upon purchase of the course, you will be added into a private group where you can ask the instructor any questions at any time. This course will also be updated from time to time to ensure students stay well-informed.